As the result of extensive primary end-user and multi-vendor research, including responses from 700+ IT decision makers, Taneja Group has learned that an increasing number of organizations are more motivated than ever before to move their applications in the cloud. However, they prefer to easily move those applications between on-premises and multiple clouds without having to modify the underlying storage infrastructure. Join us as we unpack this emerging market category along with SoftNAS, one of the vendors at the forefront of this trend. Taneja Group’s Senior Analysts Jeff Kato and Jeff Byrne will discuss the research behind the Taneja Group’s Multi-Cloud Primary Storage market category. They will be joined by Rick Braddy, Founder, CEO and CTO at SoftNAS, who will describe how the SoftNAS Cloud Data Platform provides the best pathway to shift applications among on-premises, AWS, and Azure clouds. What’s a Notebook? In this new era of agility in application development and big data science, IT may be asked to host and support online notebook environments (e.g. Jupyter or Zeppelin) - documents that can contain live code, in-line documentation, and analytical results - for data scientists, agile programmers, and even business analysts who want to explore, document, and share their work. Notebooks are certainly good for knowledge capture, but are also increasingly being leveraged as re-usable analytical applications themselves. In IT, it’s inevitable that components in our “base" layers eventually mature and can be converged into more cohesive building blocks over time. We’ve seen rack-scale IT convergence turn into IT appliance Hyperconvergence as key storage and networking functionality was finally implemented as fungible software running in commoditized or virtualized server hosting. Now Datrium sticks a knife into the monolithic Hyperconvergence appliance approach and shows how convergence can be “opened” up and applied across functionally distributed (i.e. cheaper and more efficient) infrastructure - better performance with cheaper server-side flash, lower cost with shared networked pools of capacity for data protection. In this final part of a 3 part series, Senior Analyst & Consultant Mike Matchett discusses Igneous Systems and next gen app primary storage. Igneous Systems promises to help filer-dependent enterprises keep up with all their file protection challenges with their Igneous Hybrid Storage Cloud that features integrated enterprise file backup and archive. In this highly topical interview, I get to question Frederic Van Haren about a number of big data and HPC storage topics. For years, before the world even called it big data, Frederic was responsible for some of the biggest and fastest growing big data/HPC analytical datasets in the world, actively used by large teams of highly advanced speech-to-text researchers with cutting edge analytics, and in global production operations for a variety of well-known applications. I ask Frederic for some of his hard-earned insights and best practice advice for those looking to implement big data storage in their enterprises for analytics, data lakes, and whatever the future may bring. We also get in some questions about what IT folks should do for their careers, and what to focus on first in these kinds of projects. Part 2 of a 3 part series, Senior Analyst & Consultant Mike Matchett revisits Igneous Systems file protection and discusses archive. Part 1 of a 3 part series, Senior Analyst & Consultant Mike Matchett discusses Igneous Systems file protection. As businesses become increasingly dependent on SAP HANA for real-time decisions, the demands of the infrastructure continue to grow. A more efficient and modern infrastructure is required to meet the demands of these global always on real-time environments. Storage plays a crucial role in maintaining high service levels and guarding against costly downtime. The right storage for SAP HANA is all flash. Join us as Jeff Kato, Senior Analyst and Consultant from Taneja Group describes why all flash is the best choice for HANA. Jeff will also provide a comparison of the leading all flash solutions in the market and illustrate where 3PAR All Flash leads the competition in critical storage efficiency metrics. Stephen Carpenter, Master Technologist from HPE’s Storage Business Unit, will share some key insights that distinguishes 3PAR StoreServ architecturally for HANA workloads. Additionally, Hasmig Samurkashian, Product Manager from the HPE Storage team will share actual customer deployment examples. This exciting panel explores the kinds of storage that IoT solutions demand. We talk about what’s different about data storage for IoT compared to existing enterprise applications, what capabilities are required to support massive, distributed IoT networks, and how and why existing storage solutions may or may not be the best IoT application storage. Plan on getting into unique IoT data protection concerns, real-time data pipelines, machine learning, data accessibility, distributed processing, and of course, what’s actually practical for the IoT already emerging in today’s data center. Senior Analyst & Consultant Mike Matchett dives into graph databases, and Why Facebook and the NSA love them. Computer users aren’t top data producers anymore. Machines are. Raw data from sensors, labs, forensics, and exploration are surging into data centers and overwhelming traditional storage. There is a solution: High performance, massively scale-out NAS with data-aware intelligence. Join us as Jeff Cobb, VP of Product Management at Qumulo and Taneja Group Senior Analyst Jeff Kato explain Qumulo’s data-aware scale-out NAS and its seismic shift in storing and processing machine data. We will review how customers are using Qumulo Core, and Nick Rathke of the University of Utah’s Scientific Computing and Imaging (SCI) Institute will join us to share how SCI uses Qumulo to cut raw image processing from months to days. Join us for a fast-paced and informative 60-minute roundtable as we discuss one of the newest trends in storage: Disaggregation of traditional storage functions. A major trend within IT is to leverage server and server-side resources to the maximum extent possible. Hyper-scale architectures have led to the commoditization of servers and flash technology is now ubiquitous and is often times most affordable as a server-side component. Underutilized compute resources exist in many datacenters as the growth in CPU power has outpaced other infrastructure elements. One current hot trend— software-defined-storage—advocates collocating all storage functions to the server side but also relies on local, directly attached storage to create a shared pool of storage. That limits the server’s flexibility in terms of form factor and compute scalability. Now some vendors are exploring a new, optimally balanced approach. New forms of storage are emerging that first smartly modularize storage functions, and then intelligently host components in different layers of the infrastructure. With the help of a lively panel of experts we will unpack this topic and explore how their innovative approach to intelligently distributing storage functions can bring about better customer business outcomes. Expert technology webcasts for the IT and MSP communities. 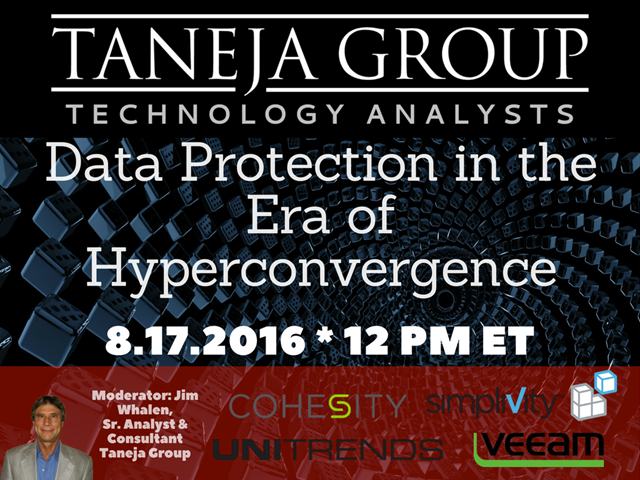 Taneja Group analysts will deliver a monthly webcast on a topic of relevance to the IT community. Our analysts specialize in researching new technologies, determine their short and long term impact and suggest the best ways to maximize value to IT. We will cover topics in storage, DR, archiving, virtualization, cloud, big data, WAN Optimization and other data center infrastructure technologies. Our job is to make complex technologies understandable and suggest ways to reduce complexity for IT AND enhance business value. For forward thinking analysis and practical advice please join our channel.